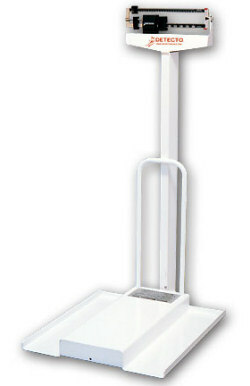 Built for use with any standard-size wheelchair, these scales offer the utmost in comfort for wheelchair-bound patients, convenience for nursing personnel and accuracy for important medical records. Detecto's sturdy design incorporates a standard eye-level physician scale with a detachable ramp, allowing for easy movement on and off the platform. The scale's beam is easily read from both sides, facilitating a faster weighing operation. 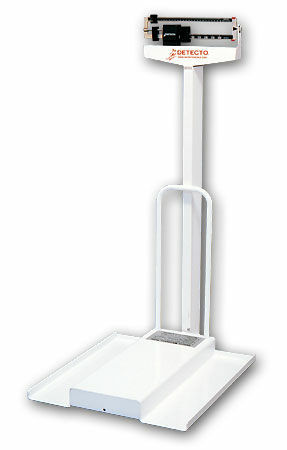 The ramp kit (model 3PRAMP) is detachable, allowing for the scale's use as a stand-alone physician scale, or a kit may be attached to existing Detecto physician scales.